Turkish Life News ‘Kadın Gözüyle Dünya’ sergimizin haberi. ANASAYFA > BASINDA DLD > Turkish Life News ‘Kadın Gözüyle Dünya’ sergimizin haberi. Art exhibition, titled “Looking at the World through the Eyes of a Woman,” which showcases works from Turkish women took place last Saturday and Sunday in Manhattan Beach, California. 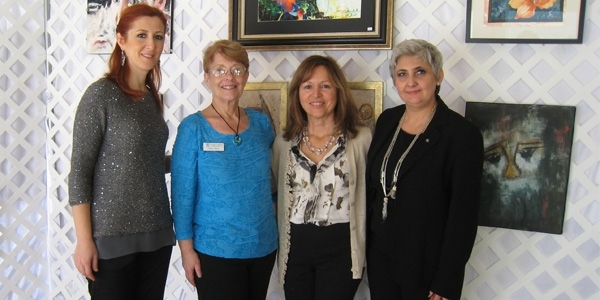 The exhibit brought together three organizations committed to supporting women; Turkish Women’s Initiative (TWI), NalancaArt and Soroptimists International of Manhattan Beach who worked on this project for several months. Additional sponsorship was provided by Turkish Airlines.. Proceeds from the sales of the art will benefit Degisim Liderleri Dernegi (Change Leaders Association) and KOSEV, both non-profits based in Turkey supporting women’s leadership and the arts. By attending the show, audiences were given insight into the Turkish culture, were able to support these organizations and at the same time saw life through the eyes of these women. The exhibit was sponsored by the Soroptimist International of Manhattan Beach who oversaw the local organization and outreach. Helen Block, the president of Soroptimist International of Manhattan Beach and the exhibit sponsor, feels that the mission of TWI so closely resembles their own, the membership has been continuing to support TWI’s work. SI Manhattan Beach is one of 1,360 clubs in 19 countries making up Soroptimist International of the Americas (SIA), one of four Federations making up Soroptimist International. The mission of SIA is to improve the lives of women and girls through programs leading to social and economic empowerment. According to Sema Basol, co-founder, TWI has developed programs and services to promote leadership, educational opportunities, economic independence and civic engagement, thereby helping girls and women to be active, responsible and productive members of Turkish society. TWI inspires girls and women to have confidence in their own voices, develop their leadership and life skills, and improve their ability to identify and solve problems in their lives, careers and communities. TWI’s innovative and sustainable programs are developed in collaboration with its sister organization Degisim Liderleri Dernegi (DLD) in Turkey. DLD is primarily responsible for on-site implementation. The exhibit had art from 28 women artists. Most of these women are over 35, some over 50 years of age. According to Nalan Kumlali, the exhibit director and founder of KOSEV, these women have discovered themselves through their art. Their art has helped them see themselves, their husbands and their environment, in a different perspective. They have seen that there is more to life than being a house wife and mom. In addition, by selling their art, they have started contributing to the family budget. For a number of these women, this will be their first exhibit. For most of them, it’s their first exhibit outside of Turkey.